After the recent horrific terrorist attacks, it’s comforting to remember someone who advocated change without assassinating cartoonists or eradicating entire towns. We celebrated Martin Luther King, Jr. Day on Monday. King was electrifying, and as a speaker he drew on his experience as a charismatic preacher. He also pulled from an enormous stock of rhetorical devices to add even more creative power and evoke emotion. His now-famous “I Have a Dream” speech, delivered on August 28, 1963, at the Lincoln Memorial in Washington, D. C., employed dozens of these, including charged words (last week’s topic!). 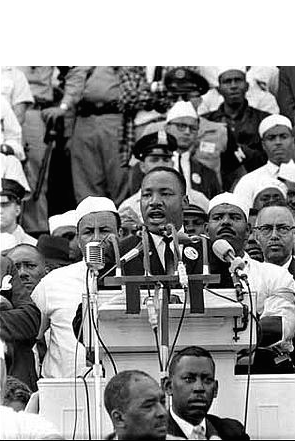 in Behind the Dream, King’s speechwriter Clarence C. Jones writes that King actually delivered only about the first half of his remarks as prepared. Then, Mahalia Jackson shouted, “Tell’em about the ‘dream.’” For the rest of his speech, King improvised, drawing heavily from the “I have a dream” language he had used earlier in lesser speeches. In fact, I recommend listening to the speech to be mesmerized by King’s rhythms and cadences (I didn’t mark these in my annotations). Below is my annotated version of the excerpt. Don’t let it overwhelm you. The takeaway is how many—and the variety of—techniques employed. I’m sure I missed some and misidentified a few. In some cases, I only marked the first instance of a technique, identifying it further through highlighting, bold, or italics. Some of the techniques I noted are not, technically, rhetorical techniques; I’ve defined them following the excerpt. Annotated Excerpt from “I Have a Dream,” by Martin Luther King, Jr. This is our hope, and this is the faith that PLEONASM I go back to the South with. Let freedom ring from the mighty EPITHET mountains ALLITERATION of New York. Now go use your creative power!